Harlem Lovebirds: My Obsession With "What Would You Do?" My Obsession With "What Would You Do?" 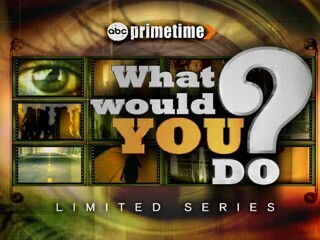 So my new favorite show is ABC's "What Would You Do?" that comes on Friday nights. It puts street people in awkward, staged situations then plants hidden cameras to see how they react. I guess deep down I like it because it reminds me of my college course Social Psychology, which was my favorite course in my major. This past Friday's episode really hit home with me as it had a shopping bully who was a calorie counter. This bully, an actor, would go up to an overweight fellow actor and her daughter, also overweight, in the grocery story and analyze and berate her shopping cart choices claiming it was child abuse. Now this hit home with me because I witness all kinds of shopping cart atrocities here in Harlem and in the Bronx where I pass BJ's when going to Target and Babies R' Us. There are so many overweight people buying processed foods and often they have children with them who are sometimes overweight too. Uka and I always lament over how sad it is to see all the poor food choices. I've watched Food Inc. and I understand about the misconceptions on eating healthy and long-term vs. short-term goals, but I honestly believe most people are out just to save money and get the most calories for that money. I have to admit there are times when I really want to speak out to the person in front of me whose 3 year old is drinking a baby bottle with soda in it while they unload a cart of white bread, orange drink, potato chips, ramen noodles, processed lunch meat and Hostess snacks. "Where are the fruits and vegetables?," I want to ask, but obviously I know it's not my business, but actually it kinda is cause tax dollars go to treat the many with ailments that are a result of these poor food and other poor lifestyle choices. I dunno, just lead by example maybe? Perhaps in the same way I'm observing other people they're observing my family. We're trim, healthy and make wise food choices (although yes, we do treat ourselves to sweet snacks sometimes! ), AND we're on a very tight budget sticking to only what's on sale each week. I hope they're taking a peek at my cart too! I'm the same way at the store! It amazes me what some people will feed their children! I silently judge sometimes. Then I realize that there is a clear dichotomy in my cart and I stop. The good healthy stuff is for me. The Fruity Pebbles, white bread, grape jelly and Minute Maid fruit "juice" are for my husband (he's not overweight though). I can't make him eat like I eat...wish I could. I do limit the amount of snacks that flow into the house but he demands his cereal, juice and PB&J.